In Steven Soderbergh’s two-part biopic, Che, the Argentine revolutionary is rendered as fully human. Walking the line between hagiography and cold warrior propaganda, Soderbergh’s movie depicts the titular militant as idealistic, hopeful, and caring, but also flawed and struggling. It never attempts to justify his violent crimes, but it also doesn’t obscure the exigence for the Cuban Revolution. 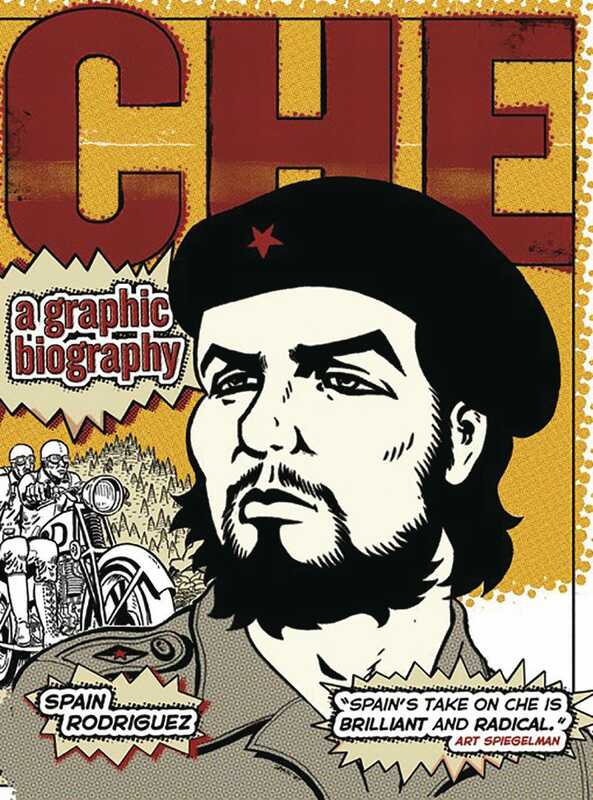 Che: A Graphic Biography (Verso Books), fails to rise to the heights of Soderbergh’s epic. Originally released in 2008, the biography has been reissued by Verso Books. While it is timely—2017 being the 50th anniversary of Che Guevara’s death—it hasn’t improved with age. 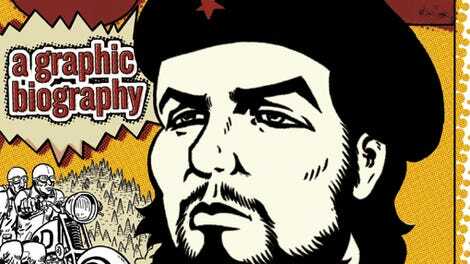 Drawn by the legendary underground cartoonist Spain Rodriguez, Che feels like the work of an artist out of his time. While this isn’t necessarily a bad thing (there is a particularity to Rodriguez’s aesthetic which so perfectly encapsulates a certain idea of what the ’60s were—visually), in this instance it often is. Unlike Rodriguez’s earlier works—which had an accomplished draftsmanship to them, as well as a complexity of depth and texture—Che is riven through by flatness. Figures in the foreground frequently blend with the landscapes into a morose midground, and the whole thing feels stilted and stiff. It moves, visually, in fits and starts. What’s more, Rodriguez sticks to simple grids, varying them somewhat from page to page, but rarely using more than a few panels and never with a surprising or striking layout. The whole thing feels stale, repetitive, and alienating where it should feel inviting. Rodriguez’s choice of narrative style further compounds these issues, and nearly the entire story is told through information heavy caption boxes that do little more than narrate the expansive gaps between panels. There is a meta-story which sort-of frames the biography (the story is hastily introduced after one friend casually asks another who Guevara is), but Rodriguez handles that device awkwardly. It feels cursorily introduced and almost immediately dropped. It, like so much else in the book, feels like an afterthought. In fact, so much of the book feels shoehorned in that you are compelled to wonder about the editorial process. With a page count of less than 110, Rodriguez crams the entire life of Guevara into the book—from his childhood in Argentina, his discovery of Marx and Freud, his infamous motorcycle journey across Latin America, through the Cuban Revolution, all the way to his death in Bolivia. Skimming through nearly 40 years of life in approximately 100 pages, the book is constrained, rushed, grinding, and laborious. And while the book is full of exaggerated claims and misleading details that give the impression of Guevara being close to his heart, it’s difficult to imagine this book in this form being a passion project of Rodriguez’s.